peel your onion and garlic and mince them super fine. set them aside in a large mixing bowl. peel the skin of the carrot and discard it. then, peel the entire carrot. once you have reduced the carrot to a pile of super thin shreds, cut the shreds into strips using a super sharp knife. cutting the carrots like this makes them soften very quickly in the frying pan and reduces the cooking time needed for the spring roll filling by a pretty huge margin. set them aside. cut about a quarter of a head of cabbage into super thin strips. once wilted, cabbage will become the glue that holds together the filling you will be using. set it aside in the mixing bowl with the garlic, onion, and carrot. add a tiny bit of oil to a frying pan and when the pan gets to medium high heat, add your pork. make sure to break up the pork into small pieces or rolling the spring rolls will be a hassle. once the pork is browned, add the veggies. it might seem like a lot, but don’t worry, the cabbage will cook down. you may need to drain the fats from the pork once or twice, but if you don’t, don’t worry about it. add salt and pepper to taste. remember, you don’t need to get fancy with your seasonings. let the texture and your sauce do the talking. once your cabbage is significantly wilted and the pork is completely done, move the contents of the frying pan to a non-plastic bowl, cover, and pop it in the fridge to cool. you can let this filling sit for a day or two if you like, but it is best used fresh. the reason you put it in the fridge to begin with is because hot filling will make your wraps super soggy and cause your rolls to be limp and hard to work with. once sufficiently chilled, uncover your filling and ready your wraps. you may also want to prepare a small finger bowl of water. the wraps will most likely come in the package all stuck together. start from the edge of the stack and gently pull one wrap off at a time. 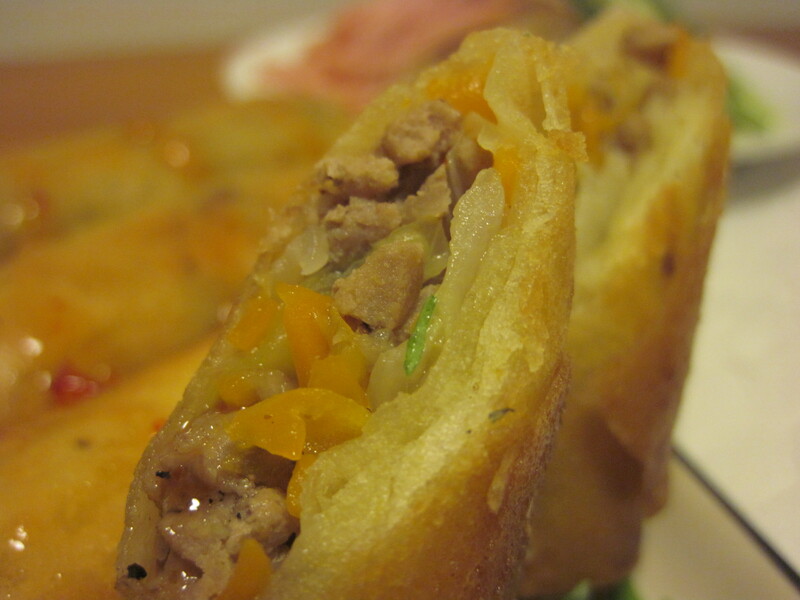 the key to not ripping the spring roll wraps is to work from the edges, not the middle. turn the wrap 45° so that a corner is pointing down (towards you). about two inches away from the corner, place a spoonful of the filling in the middle of the wrap. make sure not to overfill them, or they will explode when deep fried, and then all your work will mean nothing. tuck the bottom corner (the one pointing at you) up over the filling and underneath the other side. this will take some practice, but do your best to make the roll pretty tight. fold the right corner to the middle and do the same with the left, and then roll the whole bundle all the way up to the top corner that has been patiently waiting. dip your fingers in the water bowl and seal the seam of the roll. repeat 10 to 50 times. get some vegetable oil ready for frying. peanut oil is also excellent in this situation, but it can be hard to come depending on where you live. once you think the oil has reached an appropriate temperature, dip just the corner of a spring roll into the oil. if small bubbles come out and the oil makes a sizzling noise, feel free to add the spring rolls three or four at a time. be sure not to overfill the frying pan or your oil temperature will decrease dramatically, causing your spring rolls soak up the oil instead of fry in it. fry until golden brown on all sides, and then set aside on a triple layer of paper towels to drain and cool for a few minutes. honestly, the sauce you choose to dip them in is 100% your choice. but if you ask me and ben, there is only real choice: sweet chili sauce. pour some into a small dish, and dip till you can’t dip no more. pro tip: if you don’t think you can eat them all, don’t fry them all. these puppies keep super well in the freezer and can be added to hot oil straight from the freezer next time you are hungry. wrap a few in some wax butcher paper or throw them in a resealable plastic bag, and you have a quick snack when the munchies sneak up on you in the near future.